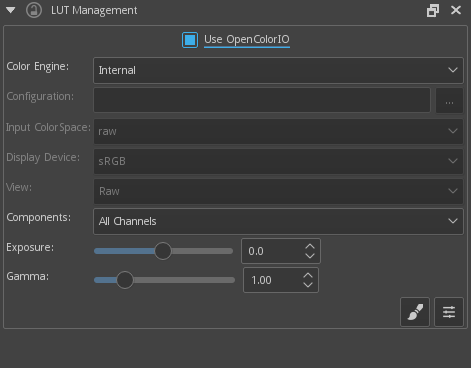 The Look Up Table (LUT) Management docker controls the high dynamic range (HDR) painting functionality. Use Open Color IO instead of Krita’s internal color management. Open Color IO is a color management library. It is sometimes referred to as OCIO. This is required as Krita uses OCIO for its HDR functionality. Use an OCIO configuration file from your computer. Some system locals don’t allow you to read the configuration files. This is due to a bug in OCIO. If you are using Linux you can fix this. If you start Krita from the terminal with the LC_ALL=C krita flag set, you should be able to read the configuration files. What the color space of the image is. Usually sRGB or Linear. The type of device you are using to view the colors. Typically sRGB for computer screens. Allows you to study a single channel of your image with LUT. Set the general exposure. On 0.0 at default. There’s Y to change this on the fly on canvas. Allows you to set the gamma. This is 1.0 by default. You can set this to change on the fly in canvas shortcuts. Locks the color to make sure it doesn’t shift when changing exposure. May not be desired. This allows you to set the maximum and minimum brightness of the image, which’ll adjust the exposure and gamma automatically to this.